In the not too distant future, humans will journey to the stars in search of their destiny. What we meet out there may be peaceful or it may be something else entirely; an ancient and powerful Imperium with a very different destiny in mind for us. 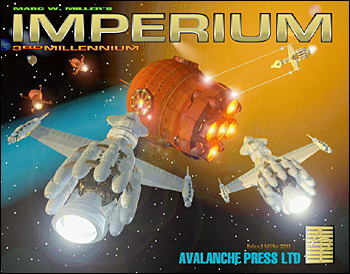 Imperium, 3rd Millennium is a completely revised and updated edition of the original Imperium by Marc W. Miller. Imperium is a game of interstellar war between outwardly expanding humans and a vast alien Imperium determined to control the stars. Players take the role of the Terran (humans) commander or the Imperial Governor and use their starships and troops to control the Sol sector.